Thinking about writing for kids or teens and want to get your children’s book published? Let me help you get your feet on the ground, or better yet, give you a running start! The Internet has a load of information about writing for children, but you’ll find there are different opinions about everything. Learn it from someone who is in the field. RIGHT NOW. I’ll tell you what I know and what has worked for me. Below I’ve laid out ten steps to publishing your children’s story. If you want to see what’s covered in this course, click here for a complete list of articles. Otherwise, walk through the course step-by-step, following the links below. step one – an idea – Have an idea. Have lots of them. If you don’t have a clue about what you want to write, reading this won’t help you. step two – know the market – Know the market. Determine what kind of book your work is. This always helps. step four – Make your book good. step six – Find an editor. step seven – Send out your work. step ten – Get a response! Then return to Step 1. Unless…YOU’RE A WINNER! You land a contract. Ticker tape flies. A marching band plays! Now back to reality. If you look at each step, you’ll notice a link. Each of those links lead to articles about that particular step in sequential order. Go to step one – an idea. OR if you hate ruining your eyesight by reading on the Internet, then you might want to try this option. Yup, that’s right! Your favorite children’s writing course is now available in paperback in the U.S. at Amazon, and across the pond at Amazon UK. This book is a revised and expanded edition of the course you see here online, plus bonus materials including templates for all of your submission needs and real-life letters from editors to authors today. See what readers are saying about the course! From writers just like you…. “… had the pleasure of hearing you speak twice. 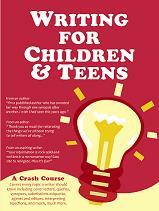 I am also an owner of a dogeared copy of your book, Writing for Children and Teens. I want to thank you!